Borrowed from L.A. Confidential (just finished watching it for the Xth time), whose writers borrowed it from Dragnet, so I might as well borrow it for a fishing report. Hatches: Size 16 BWOs (fairly heavy). Size 14 sulphurs (a few). 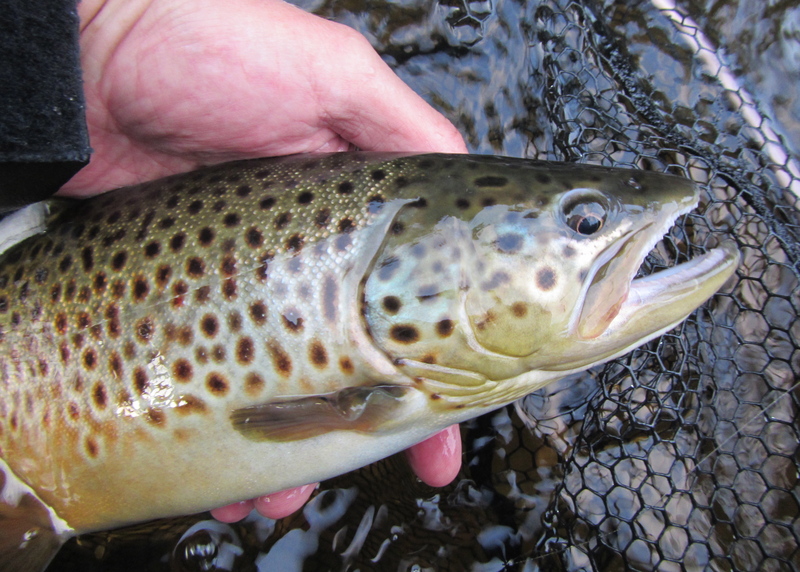 Size 10-12 March Browns (even fewer). 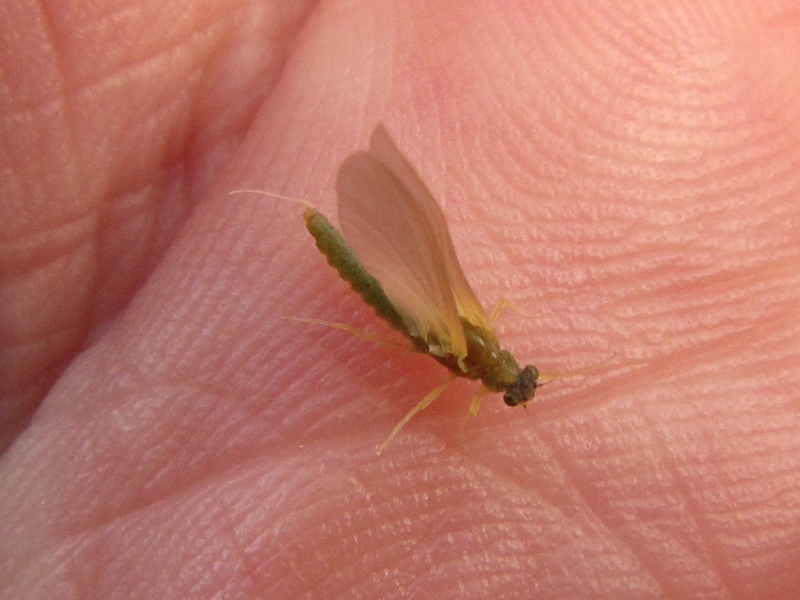 Size 16 tan caddis (some). Size 18-20 summer stenos (fairly heavy). Hello, old friend. I missed you. You’re here on July 21st right when you’re supposed to be. Summer stenos are the hatch I hate to love. I can’t think of another hatch that has caused me so much pain — and joy. Who: Ran into Steve Cook, a gentleman who took my wet fly tying course this winter. He did well, hooking trout after trout. We were also in the company of the illustrious Grady Allen, owner of UpCountry Sportfishing. Grady was there with his friend Ron. We shared the water with a half dozen other anglers, but we all had a generous amount of space to operate in, and no shortage of fish to present to. Flies: Started with a size 16 Magic Fly, then switched to a 20. The 20 worked best. Ended the evening with the size 12 Light Cahill Catskill, until I couldn’t even see that. Feeding: Weird. For the bulk of the evening I had no consistent risers in front of me. Most of the active fish from late afternoon to early evening were JV salmon. Most of the active fish were behind me, along a shallow bank, until dark, when the deep water switch got thrown. I took two nice browns, one a small wild fish, the other a low teens holdover, just by prospecting along the bank. All the other trout I hooked were actively feeding. The fish were mainly on emergers; I witnessed dozens of rises followed by an escaping mayfly that materialized from the disturbance. At dark it was spinner central, with dozens of backs visible as the trout porpoised. This is the biggest brown I’ve taken on a dry in a couple years — high teens long, thick, ham-like shoulders and a few pounds on her. She was feeding in about two feet of water ten feet off the bank. I’ve been trying to learn to play larger fish with the bamboo rod, the click-and-pawl reel, 6x tippet and small dries for years — losing plenty of bruisers in the process — and last night was the first time I felt like I wasn’t going to mess it up.